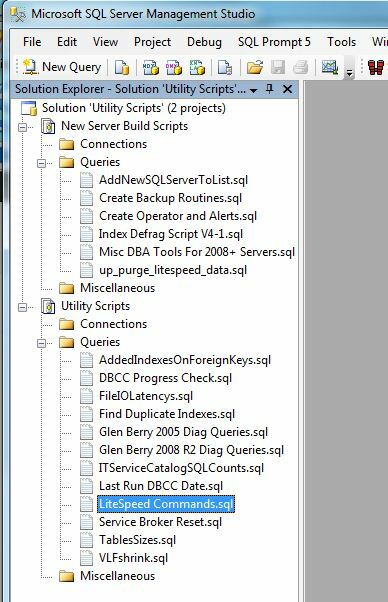 I’ve written in the past about some of the ways you can configure SQL Server Management Studio to help you make your life a bit easier. I’ve discovered two more little tricks I thought I’d pass along. Every DBA has a handful or more of T-SQL scripts they use on a regular basis to make their job easier. They could be code snippets to get some information from a server or database or to create a new user or something else that is done fairly frequently. I typically store my snippets in text files in a folder on my hard drive and leave Windows Explorer open to that folder and open the files as need and copy and paste the contents into SSMS. There’s a better way and it’s called Solution Explorer. I never really gave it a second thought because it never opened by default and I never looked for it. It’s a handy tool for keeping all your bits of SQL code handy. You can bring it up by typing Ctrl-Alt-L in SSMS or going to View –> Solution Explorer. If you right click, then choose Add –> New Solution, you’ll get three default folders titled Connections, Queries, and Miscellaneous. You can then drag your T-SQL script files from Windows Explorer into this pane. If your files have a .sql extension, they will show up in the Queries folder, otherwise they will drop into the Miscellaneous folder. Now, you can double-click on these icons from within SSMS to automagically load the script into a new query window. Now go forth and be more productive!